Thinking more about this recent drop in oil prices caused me to do a little more poking around the internet, and I came across the December 2014 OPEC Oil Report. I must admit I haven’t read any of these reports before, but it is full of interesting economic graphs and worldwide economic data (Click here to download the pdf). Note that from the charts above, the world is awash in oil thanks largely to increased US Production. 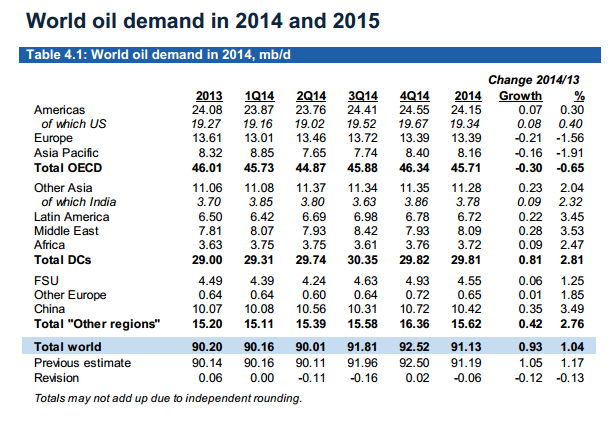 Demand for oil is expected to increase by 1+% in 2014 and in 2015, but supply is outpacing the demand. OPEC is doing the rational economic response to this; lowering production to increase prices will only sell more US Oil. The OPEC cartel is broken – after all these years there are now too many other players. 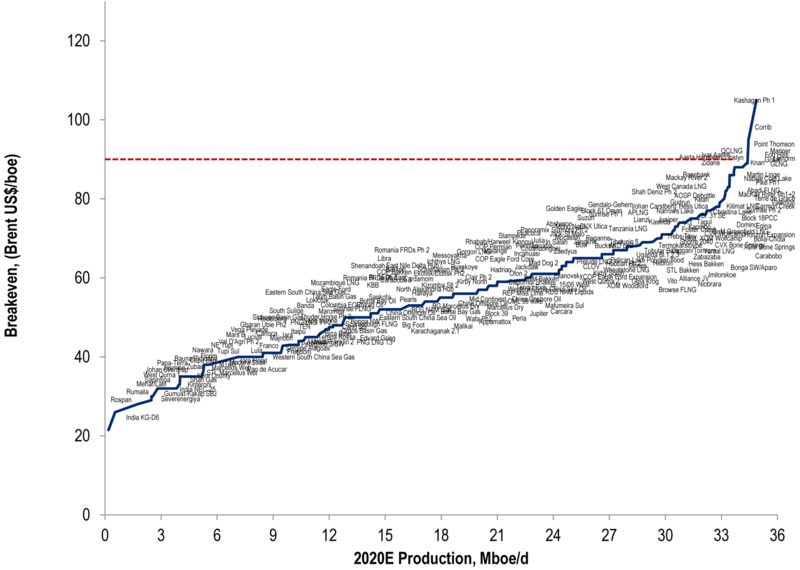 Business Insider showed this great chart about break-even prices by oilfield. 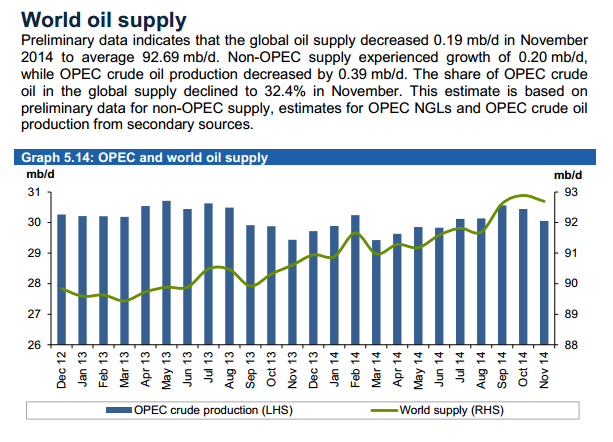 This again shows it’s in OPEC’s best interest to squeeze the higher cost producers out. So it looks like low oil prices might be around for awhile – looking at the chart above one would think the floor would be in the $50 – $60 a barrel range. Or assuming technological advances, maybe lower – throwing a huge curve ball to the worldwide fight against deflation and the assumption of constantly rising energy prices. Will eMagin turn around in 2015? I just posted an updated report on eMagin on Seeking Alpha. eMagin is moving forward on the great consumer OLED opportunity. Can eMagin execute, or will it be another disappointing year? Financials improving, but still too early to be bullish. Check it out at http://seekingalpha.com/article/2757795-will-emagin-turnaround-in-2015. The author makes a number of points that resonated with me. However, there is another thing that keeps bugging me. I was surprised to see the large number of politicians and media commentators are willing to overlook the atrocities because they may have gathered information that saved the homeland. Plus, John Brennen, director of the CIA, refused to rule out future use of these techniques. Fine. If this argument is to be used to justify possible future use of these actions, then we need to expand these programs. Why should we limit these effective(?) techniques to foreign terrorists? Shouldn’t we expand Enhanced Interrogation Techniques for use by the FBI and State and local police departments? When or why is it not appropriate to torture domestic terrorism suspects, or radicalized associates of domestic murder suspects if it could lead to gaining information to prevent future crimes against the State? The same argument should be made for the drone program. Any domestic resident suspected of conspiring to commit murder should be subject to the same death-by-drone guidelines used to suppress foreign terrorism. I would argue that the similar techniques used by the NSA and exposed by Edward Snowden should be enacted on domestic soil, but I think most Americans would agree that it is likely already the case. But we should formally disclose it. If this great nation wants to repair the damage to our alledged moral authority to the rest of the world, I see it as we have two options. Prosecute the leaders (at the highest levels) of these programs as enemies of the state, or formally adopt these policies for domestic use. At least then America would be morally consistent. For you political junkies, a couple amusing looks Washington press briefings. This article on Business Insider reveals the political theatre at the State Department. The State Department spokesperson had a prepared line when asked about the Egyptian government’s decision to clear Hosni Mubarak of murder. While the White House press gets a lot of flak for just being the mouthpiece for the government, in this case it was interesting to see some real pushback on the prepared response the State Department had. It is also curious that the State Department refused to condemn or defend this – its likely something in the US’s interest, but not defendable. Alas, at the end of the clip, when the lights go down, the actors speak the truth and you hear the spokesperson joke with a press member that ‘that Egypt line is ridiculous’. When asked why these apparently unqualified candidates were appointed ambassadors, the spokesman had a tough time responding. Finally rather than admitting it was because the Argentinian ambassador had raised $500,000+ for re-election, and the Hungarian ambassador $1.4 million, his response was basically ‘it wasn’t my decision’. Given the current quality of shows on cable TV – I may have to start watching more press briefings. Reality TV at its best. the Fed made “the right decision” and expressed “great confidence” in its chairman, Ben Bernanke. Paulson said that in the case of Bear Stearns, the risk to financial stability outweighed his concern about so-called moral hazard, in which investors come to expect government rescues. I have concluded that my risk tolerances were too taut and it was creating too much of my own intervention, in the portfolio, and it was damaging to the client’s performance. So I’ve pulled back or I’ve widened the tolerance of the portfolio. Merryn (Interviewer): So your basic point here is that if the central banks have your back, there’s no need to have the same kind of risk controls that you used to have. Hugh: There is less need. Less need. I tell you, I was at a conference with some of the great and the good global macro managers in September in New York and I asked them all the question, “If the S&P is down 12% what do you do? Are you selling more or are you buying?” Guess what? They’re all buying. So the central banks have created a behavioral tic which is becoming self-reinforcing and I believe we saw another manifestation of that behavior in October. We have seen government/central bank intervention in the US, we are seeing government intervention in Japan, and we are about to see it in Europe. Yet nobody is talking about the moral hazard this presents and, according to Hugh Hendry, is leading to a widespread increase in risk taking in the financial community.